Hi, we plan to walk the camino portugese from Porto to Santiago in April 2019 and I would like to know which resource in best and what is the value. I'm sure there are many others so what is the best? The best resource is Luis Freixo's Blog as its the best and is free see http://www.caminador.es/. 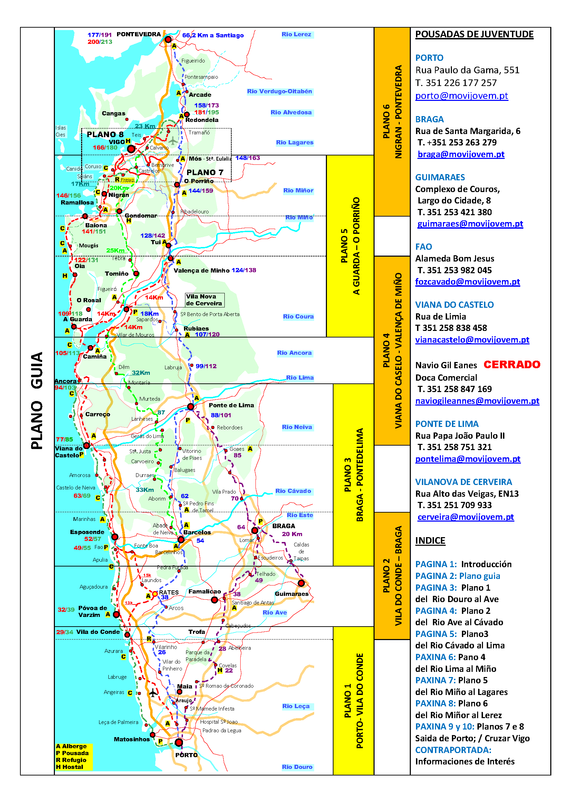 You can view his maps of each stage of every Portuguese Camino (and there are rather alot of caminos to do including another new one thanks to Luis la Via Mariana via Arbo to add to the list from Braga! ) in alot of formats like Google Maps, Wikiloc or pdf which I prefer to use as you can download to your Smartphone and use offline so you don't need internet or drain your battery. Do you really need english explanations for using a map? I think, most signs used in maps are self-explaninig or international. I used both the Brierley guide-book in 2013/2014 and his maps in 2017. In my opinion, his "maps" offer one problem: they are rather sketches than proper maps, i. e. they do not really reflect the distances. Sometimes 1 cm is half a mile, sometimes it is about 2 km. So it is nearly impossible to deduct from his maps how long you still have to walk. And the "maps"-edition (unlike the guide-book does not show the connection from Vila do Conde to Rates. So I could only walk that because I had done it before. The information about accomodation included in the "maps" was up-to-date and proved very useful. It is a very handy booklet which makes you independent from your smartphone and will even survive hard rain. Yes that's right a map is a map ! He has all formats too so for example you can open Google Maps & see where gou are (and the marked Camino) while walking ! I went back and looked at it and I'm not sure it is the best resource. For example, just looking at the first couple of days of my walk, it doesn't show Vila Cha where I slept the first night in an albergue (it should be between Labruge and Vila do Conde), and it shows the camino connection from Vila do Conde to the Central linking at Rates when, in fact, following the arrows, it linked at Arcos. And that's just the first two days. After that, I stopped looking. I found other guidebooks and apps more complete and accurate for what I walked. Not to denigrate the effort that went into this, but I would not hold it up currently as the sine qua non of resources. If you go into the PDFs, they do provide a lot of detail, but the information appears to be about ten years old. I used the Brierley guide when walking from Lisbon. No problems with that. The next times I walked the Portuguese caminho I just followed the yellow marks and prepared myself by looking on google maps what was the next place to stay the night so was informed about the distance to walk. I bought a Portuguese guidebooklet last year -will be a problem for you if you do not speak Portuguese but it gives all stages and distances in numbers.But I speak Portuguese so it is easy to say for me. This year I will follow the waymarkers again and use google maps. The map you've shown is a redundant superseded map from 2013. I stand corrected. In my defense, however, I will say that I did go to the home page of his blog and the out of date information I got, I got from clicking on what appeared to be the right links. So it appears that, as knowledgeable and important as he is, he is not always scrupulous about removing old content when replacing with the new. Best guide book for CP? Coastal or Central, for best scenery?